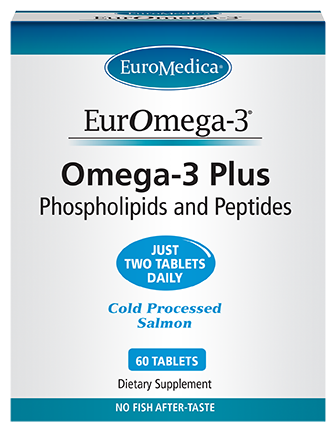 EurOmega-3® is the ONLY Omega-3 with an unaltered ratio of bioidentical DHA/EPA attached to phospholipids and peptides as found in salmon (not chemically altered or artificially spiked), ensuring optimal absorption and improved stability. Bioidentical Omega-3's are shown to be more easily incorporated into cell membranes. The Omega-3 fatty acids bound to phospholipids in EurOmega-3 are easily recognized, absorbed, and utilized by the cells of the body for optimal health benefits. Unique, scientifically studied bioactive salmon peptides (not found in krill, flax, or fish oil. DIRECTIONS: 1-2 tablets daily or as recommended by a health care practitioner. Other Ingredients: Other Ingredients: fish (salmon) gelatin capsule, gum arabic, magnesium stearate.